Looking good, and it ticks all the boxes for gaming. Fancy a good deal to kick off your Friday? 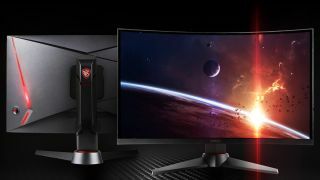 The MSI Optix MAG27C 27" 144HZ full HD curved monitor is currently on sale at Ebuyer for a rather juicy £268.98. That’s a reduction of £100 from its full £370 retail price, and it’s also the cheapest we’ve seen it in the UK. You can’t go far wrong with a brand like MSI, either. They arguably make some of the best gaming monitors. And yes, it’s Freesync compatible. Judging by its specs, this is a solid all-rounder. 144Hz refresh rate isn’t bad by any means, and 1ms response time will make for buttery smooth gameplay. Being curved is another bonus (we generally find it more immersive, and the viewing angle is better), and 27” is a respectable size for a desktop screen. It looks sturdy enough to be dropped from orbit, too, and as someone who’s had problems with thin, wobbly monitor bases before, that gets a thumbs up from me. If you’d rather splash out on an all-singing, all-dancing ultra-HD screen, check out our guide to the best 4K monitor for gaming.